Owen Griffiths (right) scored for Phantoms against his old club Swindon. Peterborough Phantoms accomplished their first leg mission in the semi-finals of the NIHL Autumn Cup last night (January 11). The city team battled out a 3-3 draw with Swindon Wildcats to leave themselves in an excellent position for the return clash at Planet Ice next Thursday (January 18). Phantoms head coach Slava Koulikov. 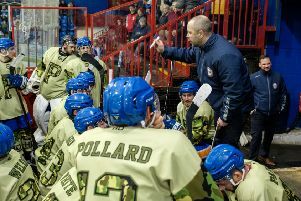 That was the requirement laid out by head coach Slava Koulikov, who saluted the efforts of his players in a tough midweek test – even though they did allow a two-goal advantage to slip in the second period. Koulikov said: “It was a good game and I think the draw was probably a deserved outcome for both teams. “We were probably second-best in the first period, but that was understandable as the away team in a midweek game where some guys had to work during the day. “Overall we did well against a good team. The job was to bring the tie back home with ourselves in a good position and we have done that. Phantoms hit the front in the first leg through a first-period powerplay effort from Nathan Salem, but Floyd Taylor hauled them hosts level on a delayed penalty. Phantoms responded impressively to regain the lead little more than a minute-and-a-half later – and just 21 seconds before the buzzer – thanks to Darius Pliskauskas. Former Swindon man Owen Griffiths then stretched the advantage when finding the net in the early part of the middle session. But the hosts came back strongly to restore parity. Swindon player-coach Aaron Nell cut their arrears before Phil Hill levelled on a powerplay. Neither side could regain the initiative in a shared final period to leave the tie delicately poised. The second leg is Phantoms’ next outing as they have a blank weekend. The club have appealed a decision from the league management committee to void their final NIHL National Cup Group B game – even though qualification for the quarter-finals could hinge on it. League chiefs took that course of action due to Phantoms failing to agree a date with Hull for their remaining home clash. Hull have already progressed as group winners, while Phantoms currently sit in second spot. But they could be leapfrogged by bottom side Sheffield, whose final group game against Hull does take place tonight (January 12).